Thursday February 17 1910 Hattie did not come out today. Will could get along without her. I sat up in bed and read a little I am growing a little stronger. It was a cold ugly day. Friday February 18 1910 Hattie did not get out very early but Will had the work all done up nicely. She went in town at 3.12 to meet Cora to do shopping. I got up and helped Will a little with our suppers. I am quite a bit better. Will to town in forenoon. The Dr sent out other medicine. 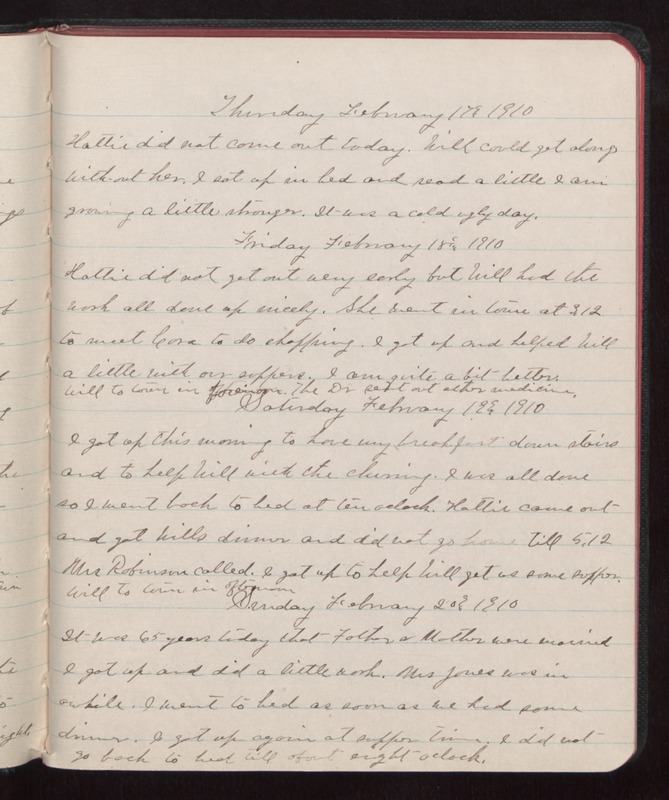 Saturday February 19 1910 I got up this morning to have my breakfast down stairs and to help Will with the churning. I was all done so I went back to bed at ten oclock. Hattie came out and got Wills dinner and did not go home till 5.12 Mrs Robinson called. I got up to help Will get us some supper. Will to town in afternoon Sunday February 20 1910 It was 65 years today that Father & Mother were married I got up and did a little work. Mrs Jones was in a while. I went to bed as soon as we had some dinner. I got up again at supper time. I did not go back to bed till about eight oclock.